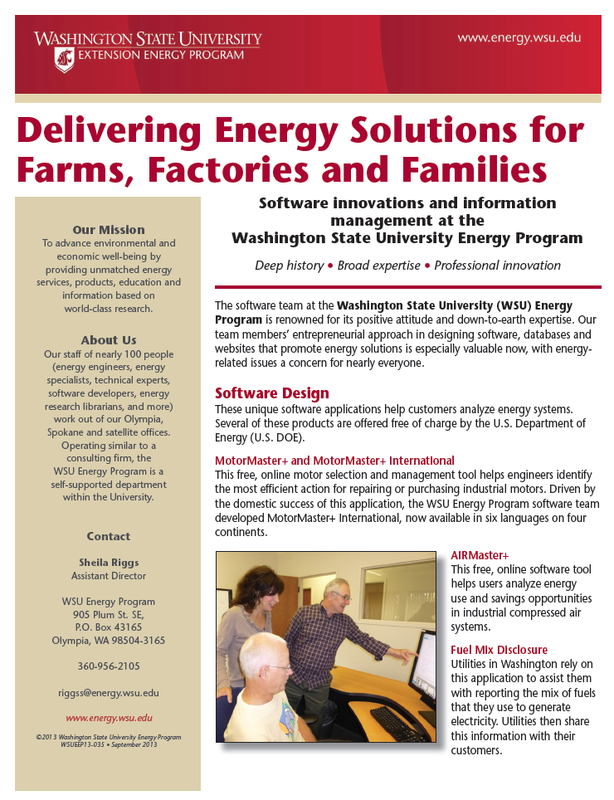 The WSU Energy Program developed the following software, including several products offered free of charge by the U.S. Department of Energy to analyze energy systems. A free, online software tool that helps users analyze energy use and savings opportunities in industrial compressed air systems. For more information and the opportunity to download the software, visit AIRMaster+. We designed, built, and maintain software to support the fuel mix disclosure process, which directs electric utilities in Washington to report the mix of fuels they use to generate electricity. We collect all of the necessary data and use the software to derive each utility's yearly fuel mix, then pass the information to the utilities to disseminate to their customers. This software tool performs a comprehensive simulation of existing and proposed district heating and cooling systems, including cogeneration and geothermal applications. HEATMAP provides extensive technical, cost, and air emission information for evaluating potential projects. We developed this free online NEMA Premium® efficiency motor selection and management tool to support motor systems planning efforts by identifying the most efficient action for a repair or motor purchase decision. This free online software tool includes many of the capabilities and features of MotorMaster+, now available in six languages on three continents. For more information, visit MotorMaster+ International. You can use this application to evaluate the financial viability of energy projects and factors key to project success, such as the minimum power sales or carbon offset price, the optimum mix of equity and capital to attract investors, or sensitivity to incentives. The users' manual is available at RELCOST Financial. This software, no longer available, provided an electronic catalog of over 4,600 fluorescent lighting lamp/ballast combinations along with software to help determine which products met the criteria (including energy efficiency) for a particular application.